An HoLa parent speaks at the Hoboken BoE surrounded by other HoLa parents sitting on the floor in an overfilled room. 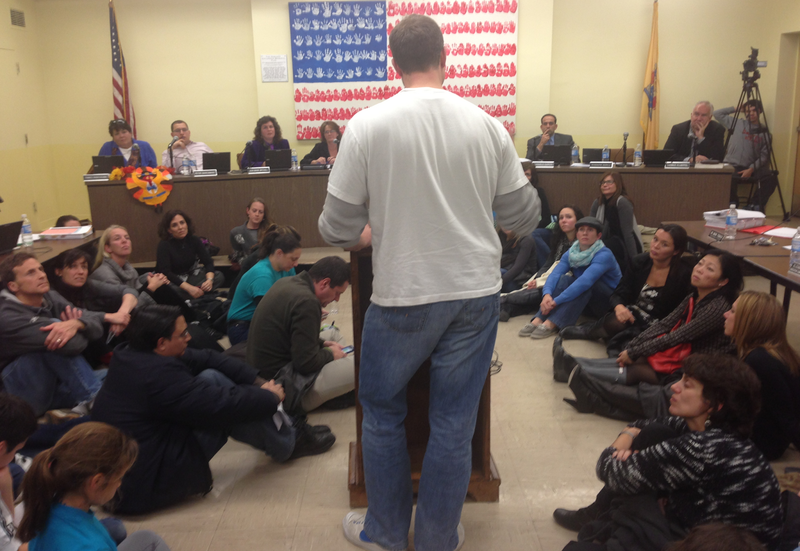 A visit to the BoE showed a rather respectful meeting where HoLa parents were petitioning the Hoboken BoE not support its Superintendent Mark Toback in his letter prepared for the NJ Department of Education opposing their expansion. Other than failed BoE candidate Brian Murray who made all negative remarks/attacks against those who he had lost to in the election last week, the parents were respectful and positive asking for support of their school. It's a conflicted situation where no easy answers will be forthcoming. Funding is already at its limits with facility issues for all four Hoboken districts an impending problem, no longer off in the distance. Some parents openly raised the issue of money and the scramble for who's going to get it. In the brief visit MSV saw several speakers and lots of parents from HoLa with Assemblyman Ruben Ramos, political operatives Matt and Nick Calicchio, Perry Belfiore, Ines Garcia Keim and also council candidate Frank "Pupie" Raia in attendance with dozens of parents. Talking Ed Note: If there is a solution, MSV doesn't see one where the taxpayers aren't going to take it on the chin. No one mentioned taxes and of course all the parents present would support higher taxes to achieve their objective of seeing HoLa expanded. One misnomer among many in Hoboken's education district is the mayor controls the BoE majority via Kids First. It's not the case and so whatever is sorted out amongst the four Hoboken school districts will be an education driven outcome. MSV has read the Superintendent letter and agrees the disparate impact is going to be felt by wider district students who include special needs children, while the charter schools have far less. One impact is that funds for all competing districts will be reduced in expansion elsewhere. It's inevitable but this circle isn't closed until say Hoboken Charter or Elysian parents descend on an HoLa board meeting and say give us part of your budget.